The 80’s movies featuring Conan the Barbarian became famous for their violence and excess, and the upcoming Conan Exile video game by developer Funcom also looks like it will feature some pretty exciting action and bloody combat like the movie adaptations of Robert E. Howard’s comics did. This is because even though gamers won’t be playing Conan or a Cimmerian character in this game, the developers have “ratcheted the brutality up to 11” in this game according to Funcom’s creative director Joel Bylos, who says in the game’s latest preview video that players will be able to “chop limbs, heads, shearing them [enemies] in half with a great sword”. And it appears there will be all sorts of creatures to vanquish in the game, from beasts to demons, plus players will of course have to deal with other players who are competing for territory in the game’s open world, trying to take over each other’s cities and bases. 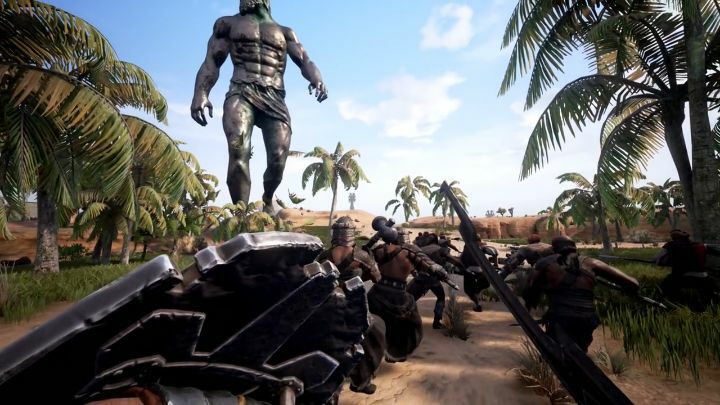 And it is clear that Conan Exiles is one of the most promising video games slated to come out this year, but it remains to be seen whether Funcom can get Exiles’ open-world gameplay right, or whether this will turn out to be another poorly executed affair… But we don’t have much to wait to find out though, as the game’s will be coming to Steam Early Access shorty, and it would no doubt be a great thing if this game ends up making Conan fans proud when it comes to consoles and PC later this year. Note: Conan Exiles will be released on January 31, 2017 (Steam Early Access on PC) and Spring 2017 (Xbox One).